Brown’s John Randolph snags a hammer over Carleton’s Luke Webb. Photo: Brian Whittier. How could we possibly capture everything that happened at Northwest Challenge? Ohio State earned the tournament’s prestigious title, defeating UBC in the final. Last time Ohio State won NWC, they won a national title…just sayin’. Title favorites UC San Diego and Dartmouth both looked pedestrian by their lofty standards while missing top contributors. North Carolina impressed in a run to the semifinal round, while Oregon, Stanford, and aforementioned UBC did enough to keep their grip on their strength bids. For all the juicy details, check out our Tournament Recap (once available). We also talked lots of NWC on our weekly podcast, Deep Look. We might have underestimated the important of I-85 Rodeo, where Georgia, NC State, and South Carolina added some key national relevance, not to mention key D-III player, Middlebury. South Carolina capped off their undefeated regular season and fell just tens of rankings points short of landing a surprise bid of their own. Of course, that also means they won the tournament, upending the aforementioned top two seeds in succession, edging Georgia 11-10 in the final. In the last season of the weekend, action went down all over the country; teams met, surpassed or fell short of the 10 game limit with serious impacts on rankings; and the expectations are set for Conference Championships and Regionals. At Towsontown Throwdown, the lone D-III team, Catholic Nun Betta, took the tournament crown, going 5-1 and beating Rutgers in the final 9-5 after losing 8-7 to them on Saturday. In small round robin play, Tulsa Tossup saw John Brown and Tulsa tangle, with the Savage Skies of John Brown taking both wins 10-7 and 7-0 respectively. At Colby’s First Annual Frolic, Colby Dazzlin’ Asses defeated Bowdoin Chaos Theory by a 10-4 margin. At Vermont Open, Smith Luna Disc went 3-1, including a win over WPI Pi-Thons. In larger competitions, the New England, Metro East, Ohio Valley, Great Lakes and Northwest regions were out in full force. Northwest Challenge Tier 2 & 3 play hosted Portland UPRoar, Puget Sound Clearcut, Lewis & Clark Artemis, Pacific Lutheran Reign and Claremont Greenshirts. In Pool A, Artemis went 3-1–including a win over Portland–and Portland followed behind at 2-2, as Claremont lost all Saturday games. In Pool B, Clearcut topped the list with 5-0 on Saturday, and Reign ended with a 3-2 record. In bracket play, Puget Sound defeated Lewis & Clark 11-10 in a semifinal matchup before Clearcut took second against California in the final. Portland similarly lost in their semifinal, before proceeding to defeat Lewis & Clark in the third place match, 12-7. Reign took eighth, and Claremont won the Sunday consolation pool 2-0. Garden State hosted a plethora of D-III teams–most notably, Skidmore Wombats and Brandeis Banshee went 1-2 in Pool A; Wesleyan Vicious Circles, Mount Holyoke Daisy Chain and Lehigh Gravity took 3, 2 and 1 wins, respectively. Amherst Sparkle Motion and SUNY-Geneseo Escargot also ended at the tops of Pools C and Pools F with 3-0 records. In bracket play, Mount Holyoke took the crown with a 13-3 win over Wesleyan, defeating Skidmore and Brandeis respectively along the way. Escargot took fourth and Skidmore tied for seventh. Out at Country Roads Classic, Shippensburg Bellewethers and Mary Washington Massacre faced off in the final, with Shippensburg ending with a perfect weekend record after defeating Mary Washington 8-5. Allegheny Hellbenderitas also attended, taking fourth place with a 3-4 record. At Black Penguin Classic, North Park cruised through pool play 3-0 before stumbling to Knox Alley Cats in the crossover play 13-5, also perfect after pool play. Knox took the crown 10-3 over Wisconsin-B, notching wins against Wheaton Mastadonnas and Wooster Betty Gone Wild. Olivet Nazarene also took home a 15-6 win over the squad from Wooster. Inter-regional play at I-85 Rodeo between D-III teams as well occurred, with the Middlebury Prankster’s 2-1 pool play record including a win over Richmond Redhots, 13-7. Swarthmore won Pool D 3-0 before taking 11th place; Middlebury ended sixth. Ram Jam saw RPI hit 2-2 in pool play and Haverford & Bryn Mawr Sneetches going 1-3, and eventually finishing sixth and seventh, respectively. Let’s hit the lightning round: Wellesley took second at Strong Island Invite, hitting 5-0 before losing to SUNY-Stonybrook in the final. Luther Freya beat Drake iBex 11-6 at Old Capitol Open; Luther ended in seventh place. Christopher Newport went 3-3 at Atlantic Coast Open, ending in fifth place. Valparaiso took sixth at Illinois Invite, ending with a 2-5 record. It’s unfortunate California couldn’t land in Tier I, as they dominated Tier 2 of Northwest Challenge. They beat their opponents by a 72 point aggregate, coasting to winning the tournament. Host team and no. 1 seed West Chester took the W at West Chester Ram Jam, defeating Harvard 10-9 in the final. On their way there, Harvard narrowly defeated UPenn in pool play and Columbia in the bracket. Knox took down Black Penguin Classic, defeating Wisconsin B by a comfortable 10-3 margin in the final. But it might deserve as asterisk, as both no. 1 seed North Park and Knox’s opponent, Wheaton, forfeited in the semifinal. SUNY Stony Brook left the Strong Island Invitational as champions after beating Wellesley 10-5 in the final. The same team defeated them 9-7 in pool play. At Country Roads Classic, no. 5 seed Mary Washington was the most dominant team in the field…until they met Shippensburg in the final. The Bellewethers won their first and only tournament of the regular season, so they’ll enter the series undefeated. After starting 2-2 on Saturday, Mount Holyoke turned it on in the bracket of Garden State. They closed with emphatic 13-1 and 13-3 wins in their semifinal and final, respectively. That’s a hell of a weekend peak! Both of the top seeds, James Madison and William & Mary, were fairly dominant at Atlantic Coast Open, a clear cut above the competition in the Virginia winds. It was fitting for them to go to overtime in the final, which JMU won 13-12. Despite a 9-8 loss to Rutgers in Catholic, they managed to rebound and get revenge to win Towsontown Throwdown. Catholic’s 9-5 victory earned them their second tournament win of the season, with both coming over teams that beat Nun Betta earlier in the weekend. Despite pool play losses, Notre Dame and Iowa State reached the final of a chilly and windy Old Capitol Open. While Notre Dame took a 3-0 lead and was up 5-2, Iowa State came back to win the tournament. Illinois Invite in Illinois was won by Illinois. All the dots are connecting. Menace lost to no. 1 seed Marquette 9-6 on Saturday, but bounced back for the win in the final on Sunday. Round robin Vermont Open didn’t have a bracket, but both Smith and Vermont B went 3-1 with a win over one another. Smith won the aggregate by a slim one goal margin, so we’ll declare them the winner. Brown went 4-0 at Colby Frolic, closing out the season with a 12-4 record. All of their losses have come to pretty impressive competition, so Brown could be a sleeper in the Series. John Brown put up a clean 3-0 record in the one day Tulsa Toss Up. There’s too many big stories from Easterns to hit them all here. What’s even the top story? #1 North Carolina‘s undefeated season ended as they lost not once, but twice! Carleton‘s back, too, having defeated UNC and reached the final. Brown‘s looking every bit the new #1 after beating Carleton in the final and UNC in the quarterfinals. Plus, bids were won and lost. It’s a lot to digest. I recommend you take a look at our Tournament Recap to really get the full scale of things. Our weekly podcast, Deep Look, also talked a lot Easterns. The poor Huck Finn attendees had to deal with quite a lot to get in some ultimate, but the steadfast TDs managed to get the teams some chance to play. The tournament moved late in the week from St. Louis to Boonville to dodge rain. 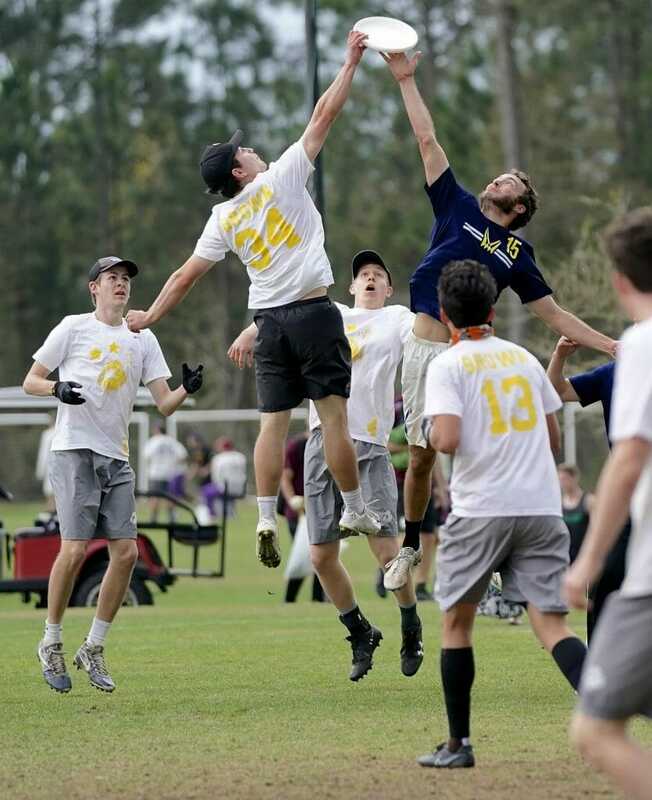 That combined with a poor weather outlook induced plenty of late drops, including Central Florida and Ohio State, the two tournament favorites and only highly ranked teams in the USAU algorithm. Even Saturday play was suspended due to snow. Once all the games were over, it was #20 Michigan sitting atop the tournament. They won an All-Great Lakes final, defeating Illinois 11-5 in the final. Texas Tech, perhaps the favorite of the remaining teams going into the first day of competition, fell to Illinois 8-7 in the semifinal, but did earn a win over Michigan on Saturday. Tough to take too much away here, but the late changes really sapped the juice from this tournament’s role in the national conversation. The New England and South Central regions are both waiting patiently to see who will get another strength bid this postseason. Tufts put together a respectable showing at Easterns, but are separated from Colorado State by a small margin. As games are ruled ineligible for various reasons, the thrown out results could be enough to cause a bid to change hands. USAU should finalize the results and release the rankings shortly, but all we can do is wait. The New England killer B’s took control at Layout Pigout: #18 Brandeis, #20 Bates, and #24 Bowdoin won the three pools on Saturday. That included a notable 10-8 upset of Brandeis over #7 Franciscan. The four squads all made it to the semifinals, and Brandeis showed it wasn’t a fluke, defeating Franciscan 13-10. But Bowdoin got the last laugh, slamming both Bates in the semifinals and Brandeis in the final. #19 SUNY-Geneseo went 3-4, but three of their losses came to the aforementioned NE trio and their last came against Haverford to start the weekend. They got that one back by a larger margin later, so their weekend looks a little worse than it actually was. Brandeis’s strong performance catapulted them up to where they could bring home a fourth bid to the NE. #10 Luther, who was at Old Capitol Open, dominated most teams, but those blowouts against week teams don’t count, and their 14-13 loss to Minnesota-B damaged their ranking too heavily. The NC is left with just three bids. D3 Eastur hosted six teams, including #2 Richmond, but they were knocked from their perch by Davidson, who wrecked them 13-5 in round robin play. #17 Davidson was the only team to go undefeated, getting a 12-7 win over Wesleyan and a 10-8 win over Messiah. We finally got a chance to see #13 Wesleyan in action, and Nietzsch Factor’s first and only regular season tournament ended with them holding a 3-3 record. They split with Shippensburg, lost by a goal to Richmond, and topped a struggling #25 Messiah squad. It was another round of Northwest knockout at Northwest Challenge, headlined by the usual trio of Puget Sound, Portland, and Lewis and Clark. The trio seem pretty evenly matched, but this weekend went to Bacchus, who went undefeated, with two goal wins over each of the other two. Portland earned a one goal win over UPS, and fell to Lewis and Clark in the final. With just one bid between them, Northwest Regionals looks like it’ll come down to the slimmest of margins. Atlantic Coast Open hosted both #1 Middlebury and #6 Mary Washington. Both won their pools on Saturday, although Middlebury needed tiebreakers after dropping their weekend opener to Duke by a 12-11 count. The two met in quarterfinals, with Middlebury earning a 13-9 win on their way to winning the tournament; they got revenge in the final with a 15-11 victory against Duke again. Mary Washington finished fifth, beating Penn State and Villanova in competitive consolation contests. How about a little love for the lower tier of Northwest Challenge? Lewis and Clark and Portland both moved undefeated to the final, despite a tough push from Puget Sound. L&C took a narrow 13-11 win over their fellow D-III Northwest squad. Yale’s 10-game win streak– all in New Haven –was snapped by Boston College in the final of Tea Cup. BC took home the most important W in the final, but worth noting that they split with Yale on the weekend. Syracuse bounced back from an 0-2 start in pool play to wax no. 1 seed SUNY Stony Brook in semifinals. They overcame SUNY Albany 12-10 in the final for Doom’s first tournament win of the season at Strong Island Invitational. Arizona went 2-0 at Desert Duel, basically a sanctioned pair of scrimmages against Arizona State B and Grand Canyon. Hey, when you’re in those big west states, you gotta find ways to get games. Not too different for UMBC, who went to Millersville and cleaned up, going 3-0 to win Millersville Round Robin. Booya finishes their season with a 5-4 record, making it above .500. Garden State fell before mighty Bryant, where the field was unable to earn more than five goals in any game against them. They’ll go into the postseason an impressive 10-0. No team went undefeated and only one team went winless at Atlantic Coast Open, with plenty of upsets at the windy pool play. Middlebury and Duke played in pool play and again in the final, and Middlebury won the latter to earn the crown. No. 1 seed Cedarville went the distance undefeated at I-85 Rodeo, mostly unchallenged. Their closest game was in the final, a 15-9 win over South Carolina B. There was a little early season buzz about the potential for Indiana to develop in the Great Lakes. They went undefeated at Old Capitol Open, defeating Iowa 13-12 in the final. They’ve won their last 15 games and both of their losses came by a single goal each, so they might be a team to watch going into the Series. Davidson won D3 Eastur with an undefeated performance, who worked over Richmond pretty good in their pool play game. This makes the D-III AC pretty intriguing. Williams traversed Uprising undefeated, though they were pushed to the brink in two separate matchups against prestigious high school squad, Amherst. But they won those games by one and two goals and won the tournament. Bowdoin dominated on Sunday of Layout Pigout, winning the semis and final by impressive margins over Bates and Brandeis, their higher ranked regional rivals. Ready for New England Regionals yet? The no. 1 and no. 2 seeds of Illinois Invite were both upset in the semifinals. Grand Valley State and Wisconsin-Whitewater did the upsetting, and Wisconsin-Whitewater edged out GVSU in the final. Unless you’re going to be attending practices, we’ve got an off weekend as teams preparing for their Conference Championships. Comments on "College Update: Easterns, Northwest Challenge, Bidwatch"